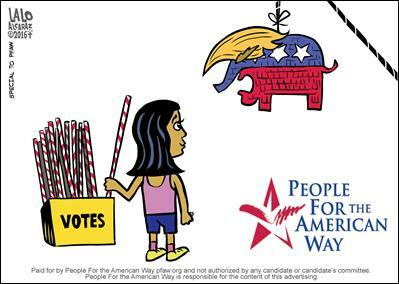 Today, progressive advocacy organization People For the American Way (PFAW) launched a bilingual voter registration ad campaign as part of the group’s Latinos Vote! program, urging Latinos to register in order to vote against Donald Trump and his campaign of bigotry on Election Day. The campaign includes Spanish-language radio ads in North Carolina, Ohio, Arizona, Georgia, and Virginia sending the message that Trump—who has called immigrants “rapists” and “killers” and supports a mass deportation agenda—could be the next president if listeners don’t register to vote in time and to vote against him. You can listen to the ad here. These ads will run on Facebook and Twitter in Nevada, Florida, Colorado, North Carolina, Pennsylvania, Ohio, Iowa, Wisconsin, Arizona, Georgia, Virginia. PFAW's Spanish-language radio ad with Priorities USA continues to run in Nevada this week. Rita Moreno, award-winning actress and singer: "Never before have we had a presidential candidate as xenophobic and unhinged as Donald Trump, and never before have Latino voters had as much power as we do now, through our votes, to decide the outcomes of elections. All those who aren't registered to vote should do so now—and remind everyone we know to do so as well—so that we keep a racist out of the White House." Dolores Huerta, civil rights leader and PFAW board member: "Hillary Clinton has made clear that she stands with us, from pledging to introduce comprehensive immigration reform with a pathway to citizenship to laying out her plans for debt-free college, and Donald Trump continues to double down on mass deportation and lob insults at immigrant and Latino communities. The difference between their running mates is equally clear. While Tim Kaine has stood strong with immigrant communities in Virginia throughout his career, Mike Pence's record in Congress shows that he's an anti-immigrant extremist, from opposing comprehensive immigration reform to even supporting efforts to end birthright citizenship. "To make sure that we are respected and our voices listened to over the next four and potentially eight years, we must make sure we’re ready to vote for Hillary Clinton and Tim Kaine and against Donald Trump and Mike Pence. We’ll win this election when we all do our part and turn out to vote—and encourage our friends and family members to do so as well." Grammy-winning band Los Tigres del Norte: "We're urging our fans to register to vote now because we have a racist who wants to be the leader of our country–and we cannot let that happen. We are for Hillary, because she respects us and values all people as equal, unlike Donald Trump, who calls us all criminals and would like to deport millions of people from this country. He'd hurt all of his through his racism and his dangerous policies." Chicano artist Lalo Alcaraz: "Donald Trump is a caricature of himself with his xenophobia, his sexism, and his overall hatred of anyone who dares disagree with him. While we may laugh at him and agree that he can never become our president, it's our votes that count. Through registering to vote, we will make a difference in this election. We'll stand up to the racist bully and defeat him when a record number of Latinos in this country turn out to vote against Donald Trump." PFAW Director of Latinos Vote! Lizet Ocampo: "You can’t vote against Trump if you miss the deadline to register to vote. Voting is the best way to make our voices heard against Trump and the Republicans this year. Our campaign asks those who aren’t yet registered to do so now, and reminds listeners to update their registration if, for example, they’ve moved. If you are not sure if your registration is good to go, check it to make sure before the deadline!" Alfonso Lopez, Virginia State Delegate: "Just as Virginia Latino voters were a critical part of President Obama, Tim Kaine, and Terry McAuliffe’s wins, we can be the margin of victory for Hillary Clinton this November. Our next president and vice president need to support economic growth for working families and protect families from deportation as a result of a broken immigration system—as Hillary Clinton and Tim Kaine have made clear they'll do—not scapegoat our communities by painting us as criminals and job-takers—as Trump has done. Those who are eligible must register to vote before the deadline so we can prevent Donald Trump from becoming the next President of the United States." Luis Angel Aguilar, CASA en Accion Advocacy and Elections Specialist: "I urge the moderators tonight to ask questions about the issues most important to voters here, like immigration reform, ensuring a living wage for workers, and affordable housing. What we already know about Hillary Clinton and Tim Kaine is that they've embraced immigrant communities while Trump and Pence have built their campaign on the backs of immigrants. Latinos in Virginia will vote against them and their dangerous agendas." Dan Ramos, Ohio State Representative: "It’s said that as Ohio goes, so goes the nation. This year, Latino voters in our state can stop Mr. Trump by voting in record numbers. We’ll reject his bigotry and instead vote for Hillary Clinton, who’s laid out in-depth plans to create jobs and reform our immigration system. It’s also critically important that we vote for Ted Strickland against Senator Rob Portman, who has endorsed Mr. Trump and previously voted against comprehensive immigration reform. He’s made clear that just like Mr. Trump, he stands against Ohio immigrant and Latino communities." Pedro Marin, Georgia State Representative: "The number of Georgia Latinos registered to vote has more than doubled over the last ten years. If more of us register to vote—and go vote—Hillary Clinton could defeat Trump in our state. With increased voter registrations and a candidate as hateful as Donald Trump at the top of the ticket, I’m confident that we can use our voting power to ensure Trump’s anti-immigrant rhetoric and mass deportation policies never reaches the White House." Hector Vaca, Action NC Charlotte Director: "Trump is utterly unqualified for the presidency; he’s showed us throughout his campaign that he has no problem attacking people based on their race or ethnicity, and he’s proved that he doesn’t have the temperament to be trusted with key decisions about our country or our world. Latino voters in North Carolina are sadly no strangers to the anti-immigrant agenda of Trump and the Republican Party. That’s why we’ll reject not just Trump, but Governor McCrory and Senator Burr at the polls." For more information about PFAW’s new campaign, or to request an interview, please email media@pfaw.org.